In 1990, the "Heimatmuseum" (local historical museum) was removed from the Old Town Hall in the centre of Hattingen's old town, and the idea to establish a new "Stadtmuseum" (Municipal Museum) was born. The search for a new location for the museum began: however, the houses in the old town were too small, full of nooks and crannies or could not be purchased. In 1994, the old administrative buildings at the market place in Hattingen-Blankenstein became vacant. Until 1970, this historical landmark, dating from the middle of the 19th century, served as the administrative seat of the Blankenstein municipality. For the following 24 years it was used by the municipal building administration. Reconstruction began in 1996. The museum inventory was then relocated. Because the building's facade is protected as a historical landmark, and because it is located in the centre of the historical Blankenstein village, reconstruction was subsidized by public funds for urban renewal. Behind these elegant sandstone facades, bright rooms were created for the museum and plenty of space for exhibitions, seminars and other museum activities. 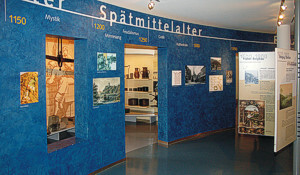 On a floor space of 600 square meters, the permanent exhibit introduces the history of Hattingen and its surrounding areas. A circle in form of an accessible history book was created in the centre of the museum to familiarise the visitor with the history of the city. A time line on the circle's wall gives an overview about the most important events in European intellectual and cultural history. Photos from the town's history are also presented on the circle's wall. Large books documenting Hattingen's history and region both textually and pictorially are installed everywhere in the museum and await your perusal. A part of the museum inventory is presented in so-called object chambers. The chambers show pieces of arranged collections according to special groups: light and lustre, scales and weights, flags, coins and household articles. The museum has special offers for different groups of visitors, school types and age groups, which consist of a combination of interpretation and activities to make learning as lively as possible. Creative activities take place in the studio: project work, painting, crafts, building and so on - a vast offering! technology-historical exhibitions. Special exhibitions with historical and/or artistic topics are continuously presented in an open showroom. On the museum's opening day, six modern artists present their contributions and objects, which were the result of artistic interpretations of the museums rooms.